Internet Services provided to Martin Engineering, LLC. 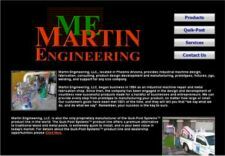 Martin Engineering has three different websites. The Martin Engineering website was designed and written with ASP.Net by us. Their Quik-Post Systems site was originally designed by Lori Martin then reworked by Imagine It. We took this site over because of the numerous code problems that caused it to be dumped from all of the search engines after it was reworked by Imagine It. Originally the website was a PHP site running on an Apache web server. The Quik-Post Systems website has been migrated to their own Windows web server and is now written with ASP.NET. We also wrote a complete end-to-end order entry and credit card processing site for their customers that they also host on their secure servers. This is a full database solution for accounts receivables, inventory, and order tracking. The web interface was written with VB utilizing both ASP and ASP.Net technologies. The backend software was written in Turbo Pascal with Delphi. Our on going services include DNS hosting, computer network installation and support, revisions to all of their websites, and their Sign Post Tracker software is always undergoing revisions. Quik-Post Systems Agent Login Page for real estate sign post installation and new account setup. Since the site is only for their customers, you can play with it on the site that we use for maintenance to test new code (spts.meicentral.net). Keep in mind the test site may be undergoing revisions and some functions may not always work. If you would like more information about what our website design services can do for you, please contact us for a free evaluation.